For the advanced birder who needs to stay informed of ABA Code​ 3 or higher sightings throughout North America. 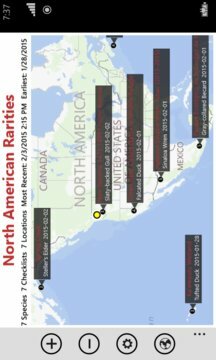 The American Birding Association​ maintains a list​ of ​North American avifauna, and ranks them as to whether they are regular, casual, or accidental visitors. 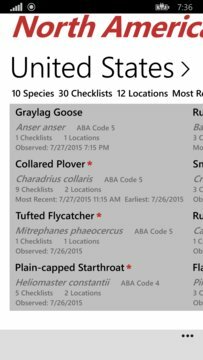 For the advanced birder looking to rapidly increase their Life List, the North American Rarities app consolidates all North American eBird observations of ABA Code 3 (rare) or higher during the past week and presents the data in an easy to read format. Users can then see a map showing the locations of where the species were observed. Available for Windows 8.1 and 10. One download for all your devices - phone, tablet, PC.